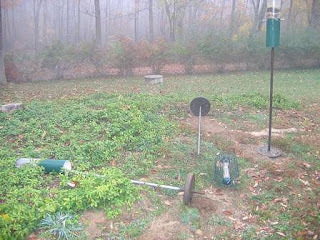 Each spring, many people take down their feeders for the season. There is plenty of natural food around, they figure, so why spend money on seeds? Actually, plenty of food is almost always. Except in the direst conditions, such as a blizzard with deep snow and subzero temperatures, year-round birds can find enough food to survive our winters; otherwise, they wouldn’t be here in cold season. For the birds, our feeders are added conveniences, be it summer, fall, winter or spring. For us, they are entertainment, as well as a source of knowledge about the wildlife around us. The truth is, we feed the birds because it’s fun, not because they need our food. However, there are arguments for not feeding in the early spring through late autumn. One arrived last week in the form of a warning from the Connecticut Department of Environmental Protection: it’s Black Bear season. Bears have emerged from their winter dens and are wandering the countryside, looking for food and mates. Bird seed at feeders (along with garbage cans and outdoor grills) attract them. “Homeowners can often prevent bear problems by making unavailable or simply removing food attractants that draw bears,” DEP said. Most inland towns in Fairfield County, Connecticut, and Westchester County, New York, have annual bear sightings nowadays – Ridgefield had 11 last year, Wilton, 7, Redding, 3, Weston, 1, and New Canaan, 1, DEP records say. A Ridgefielder had two feeders torn down last fall by what was probably a bear (see photo). Black Bears are shy and rarely get involved with humans. Some people would consider a bear in the yard exciting, but others would rather see these critters, weighing hundreds of pounds, only in a zoo. If that’s you, take down your feeder now. Another problem with year-round feeding is disease. Warm weather can exacerbate the transmission of diseases, especially those involving bacteria like salmonella. Disease can come from seeds on the ground that develop molds and/or that have been tainted with feces. Safe, warm-weather feeding requires maintenance: regular cleaning of the feeders as well as of the ground beneath them, especially if you use seeds with shells. Some people don’t put out feed in the summer and fall because they think it will delay the departure of migratory songbirds, which may then perish in cold weather. However, scientists believe the changing length of the day – more light in spring, less in fall – triggers migration, no matter how much food is available locally. Yard aficionados who like their lawns to look like putting greens eschew warm weather feeding, especially with sunflower seeds, because of the mess it can make. The husks of whole sunflower seeds, for instance, contain a poison that kills grass. On the plus side, attracting birds to the yard in summer helps control many kinds of pest insects. Bird-feeding in warm weather pretty much boils down to whether you want to do it, can afford to do it, and are willing to do it safely. If you are neat, clean and aren’t afraid of bears, feed on!